The Cameron Highlanders organization currently fields 3 separate pipe bands: a Grade 2, Grade 4, and Grade 5 band. Our bands are members of WUSPBA (Western United States Pipe Band Association). Each of our bands competes at around 6 or 7 Highland games throughout the year and takes competition seriously. 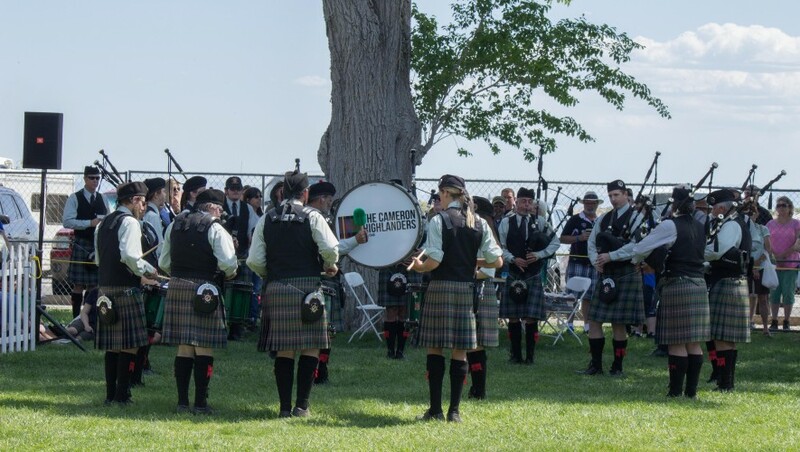 Our current goal is to compete at the World Pipe Band Championships in Glasgow, Scotland in August 2019! With this goal in mind, our bands are working hard to improve in between each competition so that we can bring our very best to Scotland! Grade 5 is the entry level band, for beginners to pipe band competitions. This band competes with two sets at Highland Games competitions: a Quick March Medley (QMM) and a March-Slow March-March set. Being in this band will teach you the basics of how to compete with a pipe band, including marching, following commands from a drum major or pipe major, and other skills like striking in and cutting off together with the band. Our Grade 5 band is currently led by Pipe Major Kathy Mars. If you are interested in joining our Grade 5 band, please attend one of our Wednesday evening practices from 7 – 9 PM at Helix High School. Directions and more information on our practice location can be found on our Instruction page. The Grade 4 band is a step up in skill level from Grade 5. It is led by Pipe Major Aaron Cornils. The two sets played in WUSPBA competitions for this band are an MMSR (March, Strathspey, Reel) and a Medley. Members of this band will have more control over their pipes, being able to strike in and cut off with ease. More emphasis is placed on the tone of the instruments and how the ensemble plays together. If you are interested in joining our Grade 4 band, please attend one of our Wednesday evening practices from 7 – 9 PM at Helix High School. Directions and more information on our practice location can be found on our Instruction page. The Grade 2 band competes in WUSPBA competitions with an MSR (March, Strathspey, Reel) and a Medley set. Mistakes are inexcusable at this level of competition, and greater technical skill is required for the tunes that are played by this band. Our Grade 2 band is currently led by Pipe Major Richard King, and Drum Sergeant Mike Jett. If you are interested in joining our Grade 2 band, please contact the leaders through our Contact Us page.